The Lake Havasu Area Chamber Ambassadors held a ribbon cutting ceremony for PetSmart celebrating its 10 year anniversary at The Shops at Lake Havasu. PetSmart is now offering vaccination clinics every Friday from 12:00 – 2:00pm. Grooming and Pet Training also available, please call for an appointment. 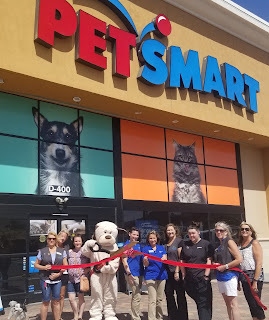 Attending the ceremony from left to right were Janina Robertson, Jennifer Whetten, Amanda Jaramillo, “Chance” the dog, Maggie Freer, Lynnae Kross, Jenna Stewart, Eileen Reed, Audrey Hoyt and Lisa Krueger.